Everyone seems to be collating lists of companies that 'win' at Facebook, and really, that's not too bizarre. After all, what's better than taking the success stories and mimicking them to get in on the action? Surprisingly, though, most of these lists are made up of food companies, and usually junk food companies at that. Of course, junk food brands do have certain challenges and ways of meeting those challenges that make them particularly well-suited to Facebook marketing. They can't claim to be healthy, and they can't rely on news reports that claim Big Macs are the new superfood, so they focus on how yummy the food is or how easy and convenient it is. While they can rely on a somewhat regular customer base, they need to supplement that base with other customers, but since there's too much competition, they have to try to brand themselves to reflect certain qualities that their target market supposedly identifies with. So they are constantly marketing, building up fun brands that reflect something about who you want to be, all while reminding you how super-tasty their food is. Basically, it's a perfect (*snort) recipe for social media success. Okay, now that the terrible puns are out of my system, let's take a look at what they're doing right, and how you can flip that around for your (presumably) non-junk food related business. Simply recognising your fans' fandom can earn you some major points. See that guy up there? 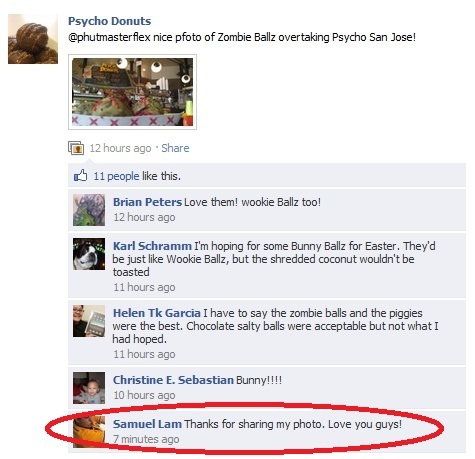 That response probably showed up in his update stream (that's the default setting, anyway) and then all of his friends would see that not only is Psycho Donuts cool, but that he actually loves them. And don't forget that recommendations from people you know count waaay more than reviews or ads when it comes time to buy something. Skittles: we all know 'em, and we almost universally like purple the least. But they are really taking their Facebook page to the next level. It's not just about the great content or the bright colours. 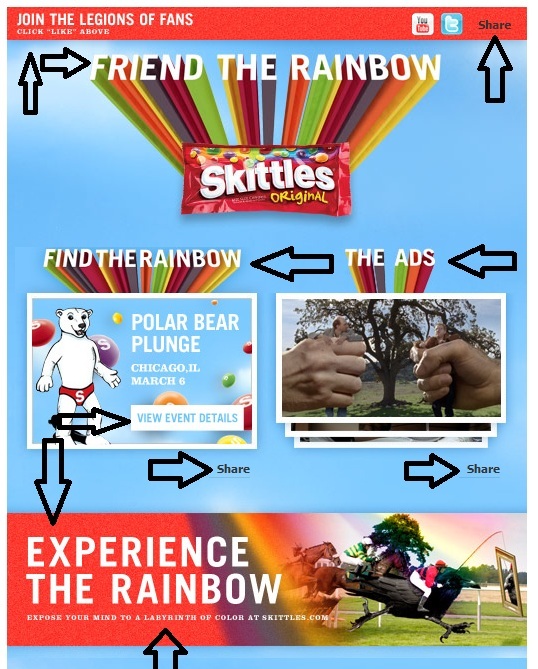 Calls to action are everywhere you look, and they point to everything Skittles do. They didn't stop at calls to action to like the page; they have calls to action to check out the ads, the website, their events - everything. I would be remiss if I didn't include Innocent Drinks, though strictly speaking they don't sell junk food. They have pretty much written the book on social media marketing. They have a superbly developed brand tone, they engage their customers in the ways they want to be engaged, and they get loads of responses to their posts. In two posts they gave their fans something for free, then had a conversation about something their fans were interested in. 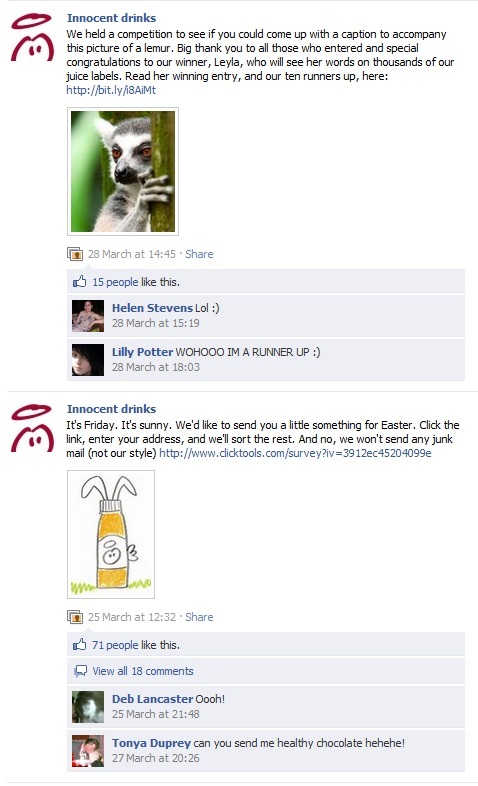 Because what's more obvious than a fruit juice company talking about lemurs? The lesson here? Give the people what they want, even if it doesn't seem to have anything to do with your product. 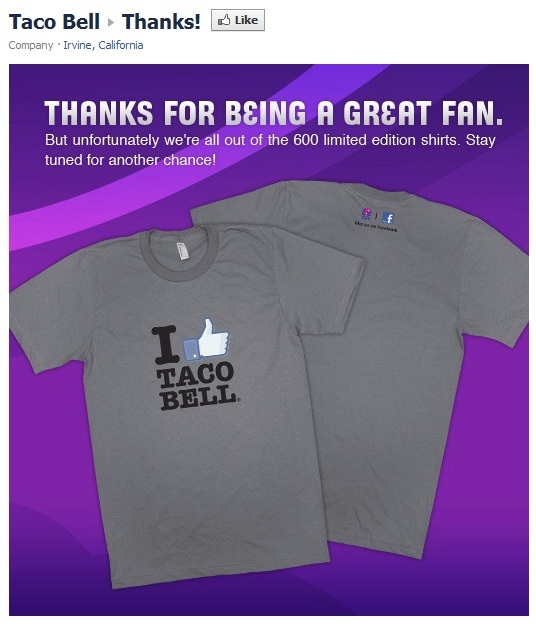 Taco Bell has clearly thought about how to make the most of their Facebook page, incorporating specially designed landing pages and even a section devoted to careers. But that takes dev time and suchlike, so what can the small business owner or fund-limited consultant do? Regularly do extra-special things for your extra-special fans. You'll get loads more extra-special fans then. 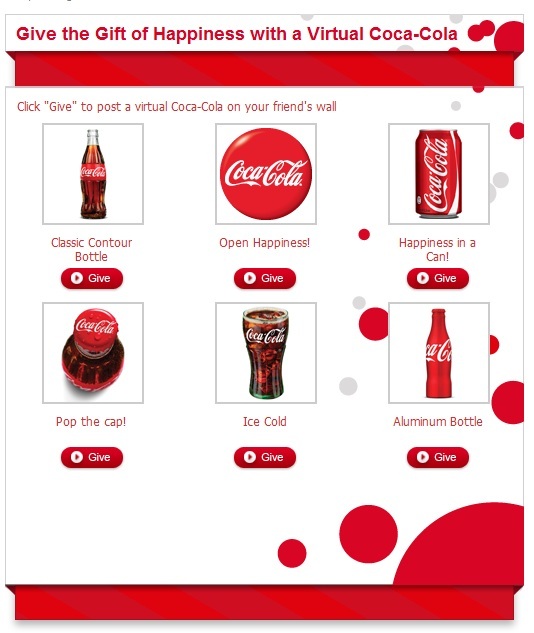 Coca-Cola, they say, is the second most recognised word in the world (the first place spot goes to 'okay', apparently). So it's not surprising that they have more than 24 million fans. But one cool thing they do is that they provide fans with loads of ways to act as brand ambassadors - which basically means they encourage their fans to talk to their friends about the brand. Help your fans share you with their friends in subtle, fun ways. Incidentally, I've found all these examples largely because of Hannah Smith or because of eConsultancy, who have loads of amazing posts about social media.